We wanted to have a Sunday lunch near the sea, so thought we’d give Whitstable another go. In my previous research for The Oxford, I had found out about the East Coast Dining Room – sounded up market and worth trying out. I gave them a call and booked for the following Sunday (after letting them know dietary requirements for JW, our toddler). There wasn’t a car park for East Coast Dining Room, we found a space a few minutes walk. The venue is on a main road with a white shop front and a patio area. Upon walking through, there’s a small bar area at the front. We were welcomed and shown to table at back. Note – there were no highchairs so JW had to sit in a grown up chair! Something to ask for with other venues from now on. With contrasting white and dark green walls, sea paintings and jazz playing through the speakers, the venue had a smart and relaxed feel to it. Our table was laid out with linen napkins and we were served cucumber water (a refreshing taste, first experienced by me at The Great House in Hawkhurst). As mentioned, cucumber water was served when we sat down. Claire and I both ordered a diet coke each. We skipped starters and went straight to main courses. 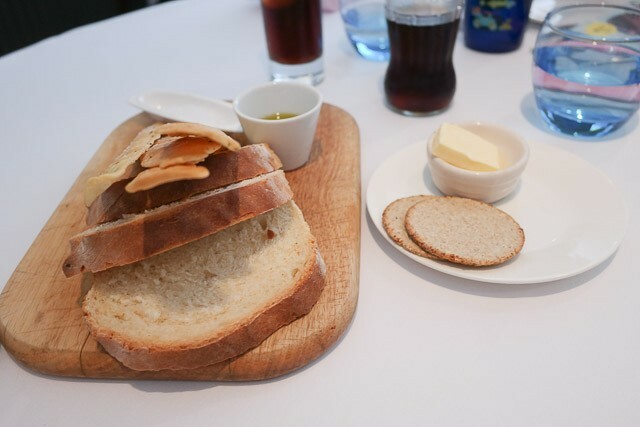 Whilst waiting for the mains to be served, we were brought some wonderful bread for us – and kindly brought JW some gluten free crackers. The waiter was excellent with helping us choose our mains, explaining that the lamb was served pink. We ordered two adult roast lamb and a chicken for JW (dairy, wheat and gluten free). 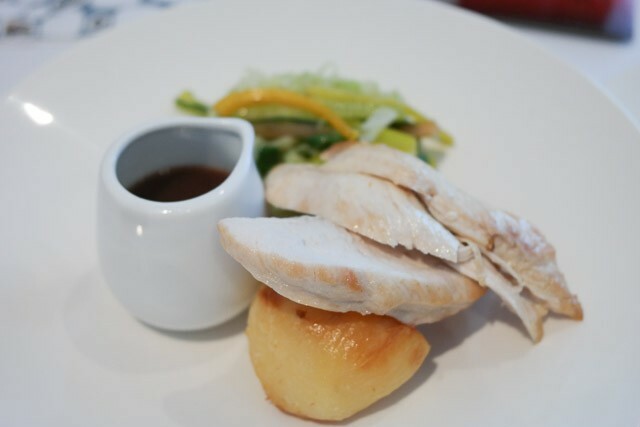 JW’s lunch consisted of two roast potatoes, sliced chicken breast with vegetables and a small pot of gravy. Our plates had 4 slices of lamb, 3 roasts, shredded cabbage, small cubes of carrot, parsnip and swede with mint sauce in a pot and a splash of gravy. The lunch looked great with lots of nice colours on the plate. Tucking in, the lamb was very tender and delicate. The potatoes were great with a nice flavour and excellent vegetables. It was a good size without making me feel too stuffed. As the mains were so nicely presented, it would have been rude to leave without dessert. 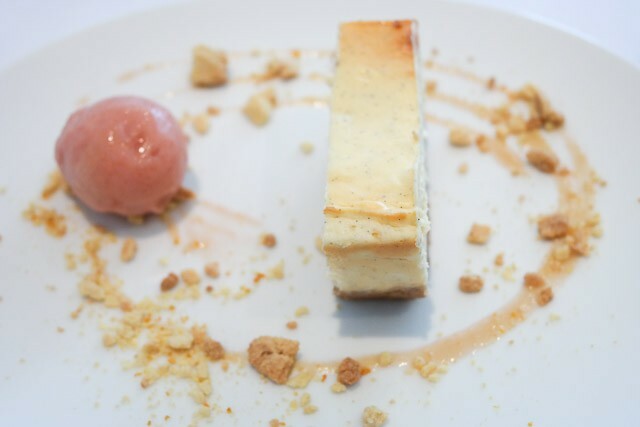 Some interesting choices, Claire ordered the Brown Sugar Meringue with champagne and grapefruit sorbet, I asked for the Baked Cheesecake with rhubarb ice-cream. 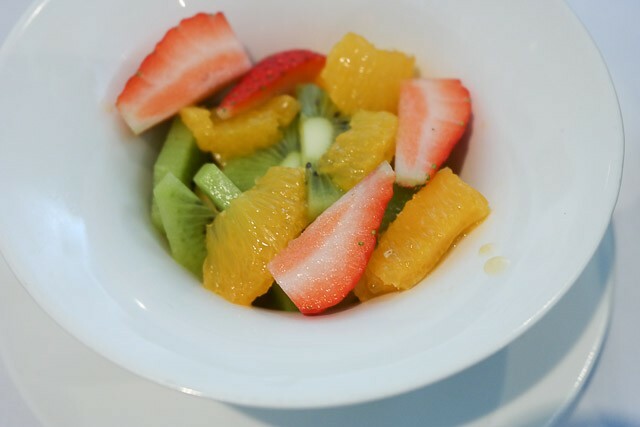 For JW, they were able to provide a tropical fruit salad. 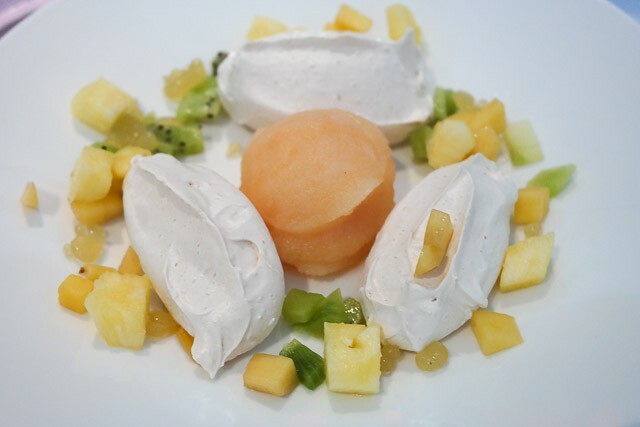 Claire’s meringue was nice, the champagne and grapefruit sorbet very refreshing. My baked cheesecake excellent with the vanilla seeds dotted throughout and I loved the base which had ginger! They were able to provide a smaller meal for JW, being £7.50 for the main and £4.00 for the dessert. With no highchairs or baby changing facilities, it’s not really suitable for young children. 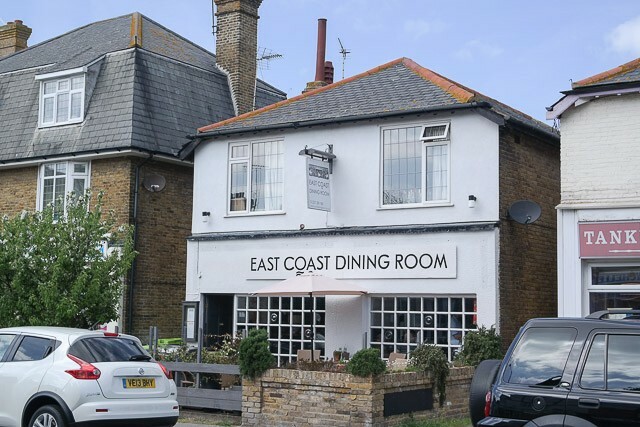 I really enjoyed our time at East Coast Dining Room. 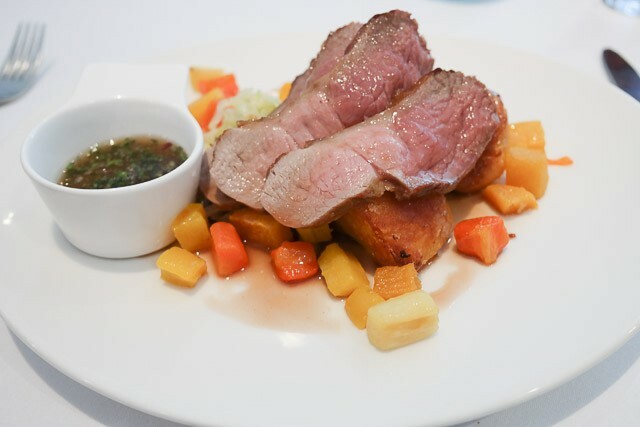 The food was excellent, tasting good and nicely presented (the lamb and roast potatoes especially good). The service was also excellent, with the waiter and chef being accommodating for JW (including the gluten free crackers). So, it is a Top Rated award, best suited to adult only parties (or at least, with older children).